This Is Our Jam Premieres: Rainbow Arabia, "Lacking Risk"
Back in 2011, L.A.-based synth-pop act Rainbow Arabia turned heads when it announced that it would be joining the roster of minimal techno powerhouse Kompakt. 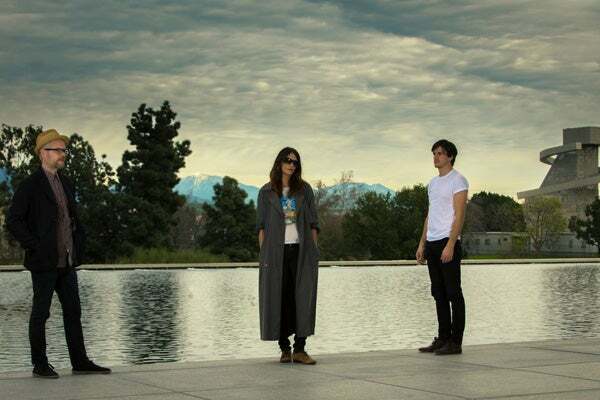 More than two years later, it still seems like an inspired pairing for the band (now a three-piece with new addition of drummer/multi-instrumentalist Dylan Ryan joining husband and wife Danny and Tiffany Preston), and the trio's upcoming FM Sushi LP continues to further play with expectations and expand the group's sound. New single "Lacking Risk" is a relatively low-key effort, with slinky synths set to spare percussion, and Tiffany's voice cooing abstractly within the mix. Alongside the vaguely Middle Eastern/North African rhythms the band is known for, Rainbow Arabia has set its synths on '80s pop mode, with washes of Hi-Liter brightness that sounds like it was taken from an '80s thriller soundtrack. The resulting mixture is an ethereal pop track, with just the right amount of cheesy gloss. FM Sushi is out April 15 via Kompakt/Time No Place.